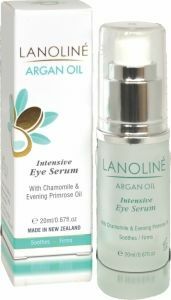 LANOLINÉ Argan Oil Intensive Eye Serum helps to sooth and firm tired eyes by intensely moisturising the delicate eye area. Fragrance free, it absorbs rapidly to restore a smoother, firmer appearance. Directions: Gently apply around the contours of the eyes, using the finger tips in an upward outward motion. Use morning and evening or as required during the day. Ingredients: Aqua, PEG 8, Cyclotetrasiloxane(and) Cyclpentasiloxane(and)PEG/PPG-18/18 Dimethicone, Cyclotetrasiloxane(and)Cyclopentasiloxane, Aloe Barbadensis Leaf extract, Oenothera Biennis (Evening Primrose) Oil, Tocopheryl Acetate, Polysorbate 80(and)Cetyl acetate(and) Acetylated Lanolin, Chamomilla Recutita (Matricaria) Flower Extract, Green Tea (Camellia Sinensis) Extract, Argania Spinosa Kernel Oil.